The governor has sent the Legislature a proposed budget to address the situation, but his recommended solutions do not strike at the cause of the crisis. 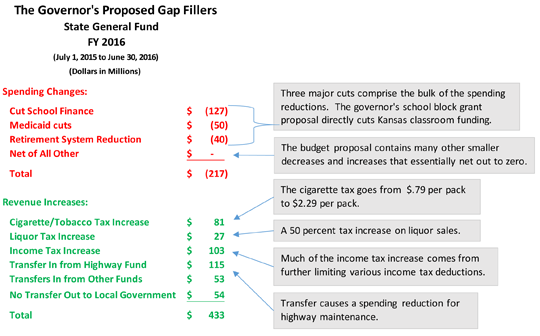 The Kansas Legislative Research Department has calculated that revenue will be $650 million below expenses in FY 2016. If you accept that Kansas school finance spending is unconstitutionally low — as a Kansas district court has ruled recently — then the gap is actually much bigger. If you acknowledge that the general fund should have an ending balance larger than zero, then the gap is startlingly large. While the state’s budget problems are caused by falling income tax revenue, only a small portion of the governor’s proposed new revenue comes from a slight moderation of income tax policy. The governor wants to more than double cigarette taxes and apply a 50 percent increase to the sales tax on liquor, but even those high percentage increases do not come close to making up for the income tax revenue losses. The governor is also proposing serious spending cuts, especially to public education. Kansas classrooms do not get more money — rather, $127 million comes out. Medicaid, which should be expanded, gets tagged for $50 million in as yet unidentified “savings.” Fixing the state’s retirement system is put off in the short term by adding more cost in later years. Plus, the proposed transfer of money from the Highway Fund will mean cuts to highway maintenance. The cuts to education and other services are damaging, but will get even worse if more revenue is not found. Lawmakers no longer have the option of making up for low revenue by drawing down the general fund bank account. It is gone. They must bring revenue and expenditures together somehow. The income tax cuts have left Kansas without enough resources to pay for education and other key programs. 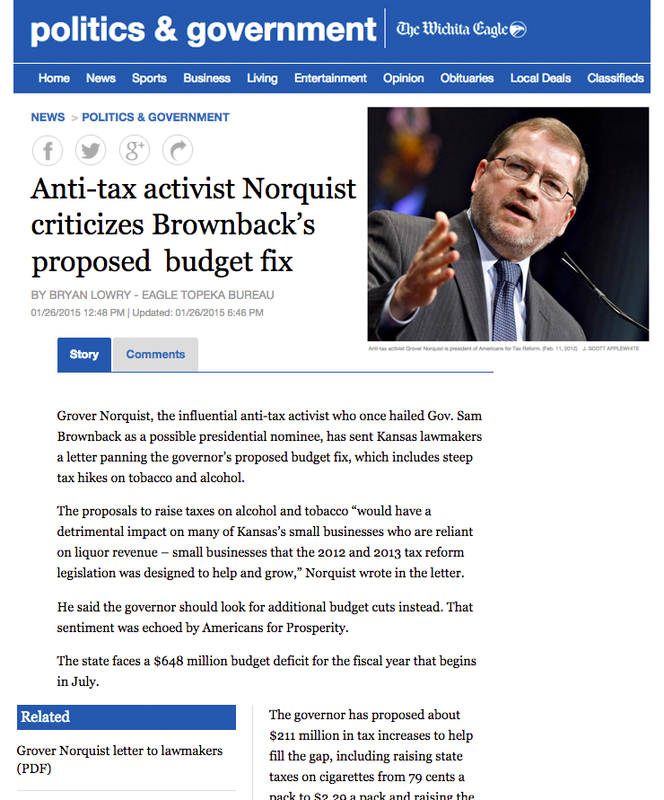 It’s unfortunate that the governor did not focus his budget squarely on correcting his tax policy — the root of the problem. Note: This blog entry was first posted here on Feb. 5.